Just announced! 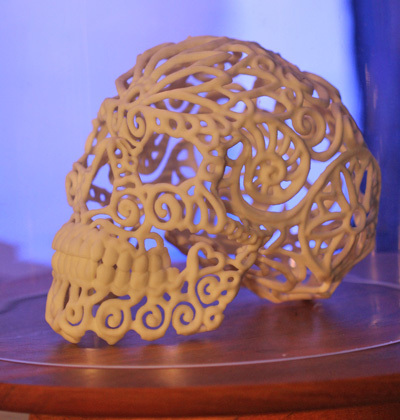 Next year, the first professional-grade culinary 3D printer for bakers and pastry chefs will be available, according to an article in the May 2015 issue of Bake magazine. Just imagine all the amazing and intricate cupcake toppers you could create with that. No word yet on a price. "Showcased at the National Restaurant Association Show 2015 in Chicago, the ChefJet Pro from 3D Systems (3DS) can create full-color bespoke confections for an unlimited array of applications, such as sculptural, ornate cake and cupcake toppers, candies, delicate latticework or logo sugar cubes." "To add specific flavors to any 3D food piece, you can dehydrate whole fruits or vegetables and add to the base ingredients, which are typically sugar, salt, oil and water." 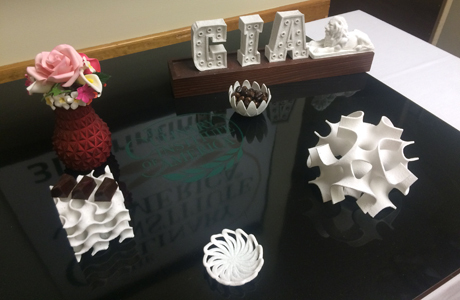 "The CIA collaborates with 3DS, which constructed the first 3D sugar food lab in the world, to enable culinary professionals to explore 3D printing capabilities for pastry chefs and bakers and to empower new and exciting ideas. To advance the project, 3D Systems is developing the world’s first culinary innovation center in Los Angeles near the corner of Melrose and Highland, which is regarded as the influential epicenter of the city’s culinary community. The 3DS Culinary Lab will open in summer 2015 as a cooperative learning, collaboration and exploration space where industry professionals can experience the ChefJet Pro professional food printer firsthand.